Eavesdrop is an amazing little addon that I’ve literally used for years. I think I first discovered it during Sunwell when I was raiding on my warlock. Since then, whenever I have redesigned my UI, eavesdrop has been a core feature. I find eavesdrop much easier to navigate than a normal combat log. It’s highly visual appearance makes it very easy to distinguish between your outgoing damage or heals and your incoming damage. Establishing precisely what killed you during a raid is very easy. 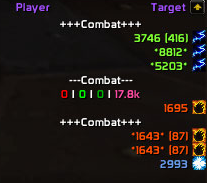 This makes it simple to conclude whether you were out of position or for example, lacked incoming heals during a period of high raid damage. I’ve mentioned in order user interface related posts that I do not like scrolling combat texts. I don’t like anything scrolling across the screen that can draw my attention away from the environment. I see so many screenshots of raid UI’s where scroll combat text in it’s default state covers a large area of the crucial area around your character and can potentially obscure spells you need to be moving out of. Eavesdrop, for me, is a nice compromise between an effective combat log that still allows you to see your visual and live damage during an encounter and not having distracting text scrolling across your main playing area in game. This addon will work straight out of the box and additionally, it’s customisation is very easy. The command line to open the configuration panel in game is /eavesdrop. Upon opening, the default configuration tab will show events. These are simply the different events you can choose to show or hide from the frame. I personally prefer to keep mine relatively uncluttered as I don’t like sifting through endless ticks of, for example, mana stream totem to find what hit and killed me. 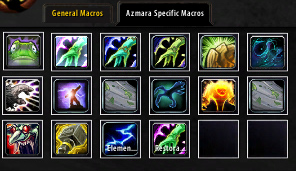 Buff and debuff gains and fades I deal with via other addons so they’re all turned off. For those who do wish to display buff gains, scrolling over them in the log will also give you a time stamp and a detail explanation. 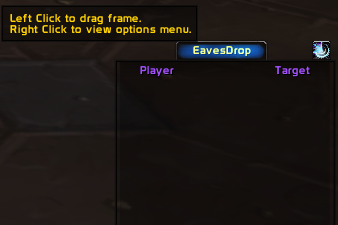 When you first load up the addon, moving it around is done by clicking on the tab at the top of the frame and dragging it. Once you have it positioned where you want it, resizing can be done via the configuration window. This is accessed by typing /eavesdrop in game. When the configuration window opens, select the “frame” tab from along the top of the panel. The above screenshot shows the multitude of options available to resize the eavesdrop frame. Here you can resize both the frame and the text size itself. There are also check boxes to hide the default tab that will appear at the top of your eavesdrop window in addition to locking the frame so you can’t accidentally move it. You’ll notice an option in the configuration window entitled “spell damage colours”. This option will colour your spell damage according to the school of damage. This is demonstrated below with the different colours applied to our nature, fire and frost schools. You need to select outgoing spells from the window to the left and this will open a very simple colour selector allowing you to choose the colour your spell hits show as in the eavesdrop window. The result, as shown above, is that all outgoing spells will display in the colour of your choice. Should you still want to keep a differentiation between the colours of different magical schools (for example, your lightning bolts versus your lava bursts), this is perfectly possible also. Once again, open the configuration window via the /eavesdrop command in game. Select “colours” from the tabs along the top of the window. Selecting “spell colours” will open a window displaying different schools of magic (fire, frost, <font color="#66cc66"nature and so on). The colour of the frame, it’s opacity and the colour of the labels can also be changed via the configuration menu. From the configuration menu, select “frame” from the menu on the left. From here, you can select the background colour of the frame along with it’s level of opacity. 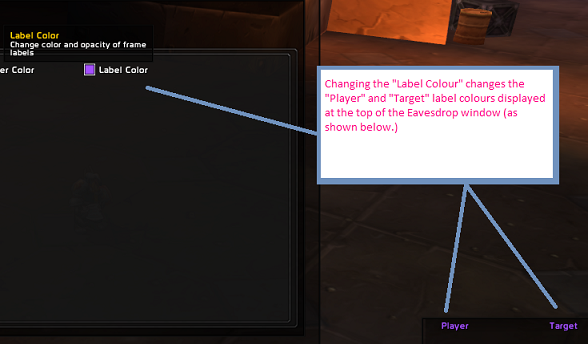 In addition is an option to alter the label colours of the main eavesdrop frame. Eavesdrop is available either via the curse downloader or directly from curse here. As I mentioned at the start, eavesdrop has been one of the few addons that has been with me for a number of years. I spend a lot of time browsing new addon releases and I’m always willing to try and test them. Sporadically, I will stumble upon an addon that I never remove again and eavesdrop definitely falls into this category. 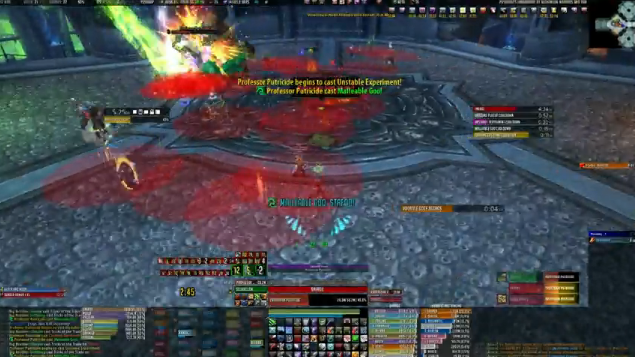 During raids it is vital to keep as much screen real estate free and clear as possible. If you can’t see environmental effects due to so much addon clutter, you can’t possibly hope to react to them and stay alive. Equally vital is knowing when you make a mistake and how to correct this. These mistakes can vary from personal ones (that is to say, you stood in that fire and you died, learn to move) or raid related ones (this encounter has a raid wide aura and I received zero heals here guys.) An effective combat log is vital to stay abreast of what is happening and how you can improve. Effective is a key word however, it still needs to be navigable and easy to interpret. Undoubtedly, eavesdrop fills these requirements for me. 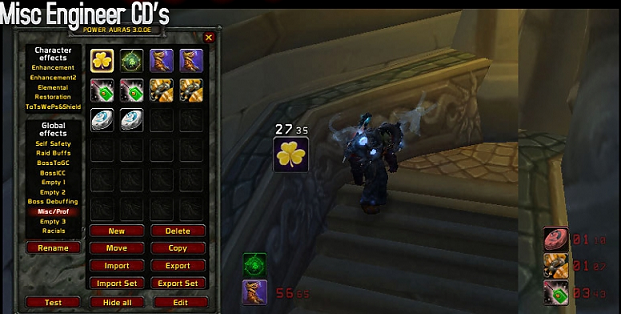 I’ve always had a peculiar relationship with addons. The game I came from had none. We didn’t have boss timers. We had members of the raid sat at the other side of their PC’s with stop watches timing the AoEs and announcing them in game. After a certain amount of time, people were expected to handle this themselves and as with most things, you gained an inner feeling for when things were due to occur. No warnings, no boss timers, just your own knowledge of the encounter and your own ability to react to what was happening around you. When a new MMO, Aion, launched last year, there was uproar on the forums when a discussion began about whether the developers should allow addons to be developed (and used) in game. People were very split on the issue but there was a strong feeling from some of the community that they did nothing but dumb down the play experience. A few years ago when Nihilum were still the top raiding guild (and yes, I know I mentioned them yesterday), I read an article about their recruitment. One thing mentioned was that their GM, Kungen, particularly liked old Everquest players. For reference, this is the game mentioned above. Why? Because he believed that raiding there made more reactive, responsive, alert players. WoW is a little different these days and boss encounters are more complex and undoubtedly designed with the idea in mind that most people use boss mods. They work by providing us advanced warning that an ability is about to happen. This allows us to move, stop DPS, spread, stack, switch target or otherwise respond in whatever way is appropriate. Today I had this addon linked to me. Essentially, it adds additional visual effects in game to aid with certain boss mechanics. There are a number of examples on their wowace page, ranging from displaying where Malleable Goo will hit on the Putricide encounter (and it’s “splash” area) to where to stand with your tombs on Sindragosa. I’ve taken some stills from their youtube movies. Apologies for the quality, but they’re directly from videos. You should get the idea however. 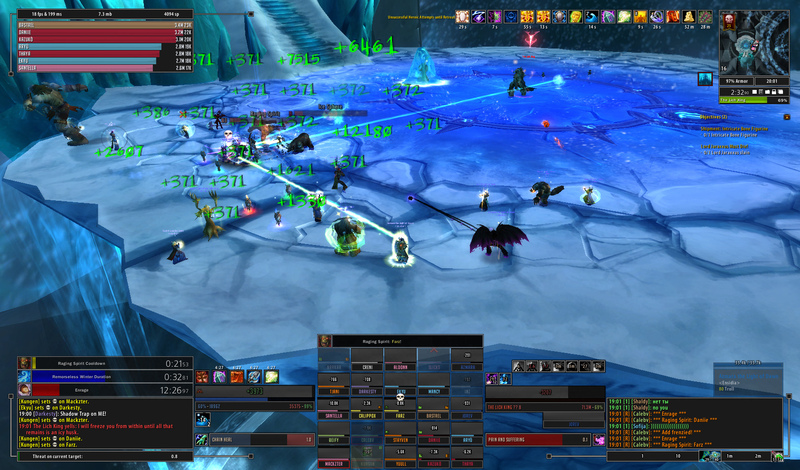 Below we see the addon running on a Sindragosa 25 raid. It’s visually displaying where the players marked for tombs should stand. Obviously, these positions are perfectly calculated to prevent any splash damage between the players, as is shown below. 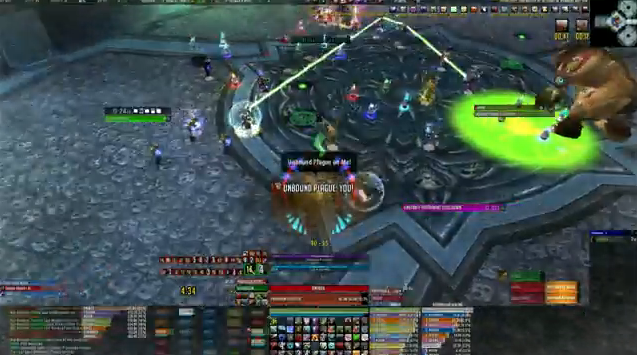 On the heroic version of Professor Putricide, one of the key mechanics that your raid has to learn is the tracking, monitoring and passing of the Unbound Plague. This addon clearly marks that person, again with a circle, signifying precisely how close you could potentially be before passing it. 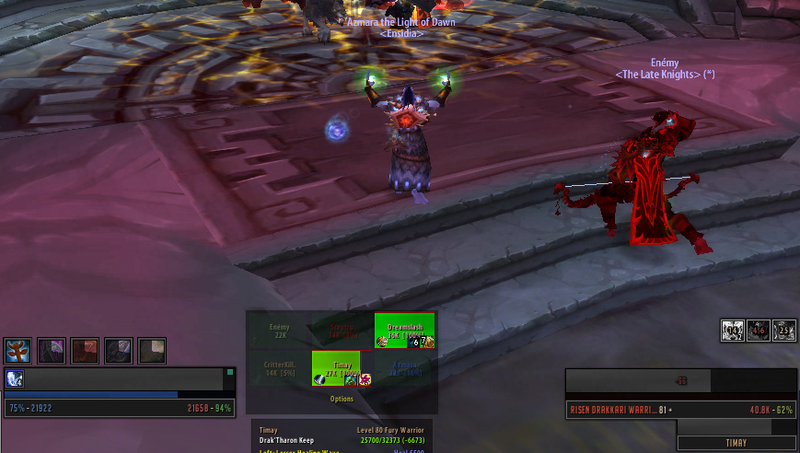 The screenshot below shows the player with the debuff marked clearly. The next screenshot shows the plague being passed over to the next person. I’ve blogged a few times in the past about what I believe makes a skilled PvE raider. One core trait for me, is the ability to concentrate. It sounds very basic but so many players watch TV while raiding or perhaps have a second monitor playing movies or just browsing the internet. The skills required to be a good raider are not something that you’re born with, they develop through practice. Consider when you first level a new character to 80 or when your class is altered in such a way that you need to master a new spell rotation. This will feel awkward at first. A great deal of your concentration is sucked away by trying to keep the rotation perfect whether this be not clipping a dot, not letting a dot fall off a target entirely, or ensuring your cooldowns are used in a timely fashion. The more you practice, the better you become and the more natural your rotation comes to you. Before long, you can perform it in your sleep. This frees up more of your attention resources to focus on other things – such as what is happening in a boss encounter. The same thing happens in reverse. When you first learn a new encounter, there can be various environment effects occurring that you need to react to. Until you’re comfortable and familiar with these, they will take up most of your attention and your DPS will likely fall. As you become familiarised with the encounter, your reactions to the stimuli (the events in game) becomes more natural too. 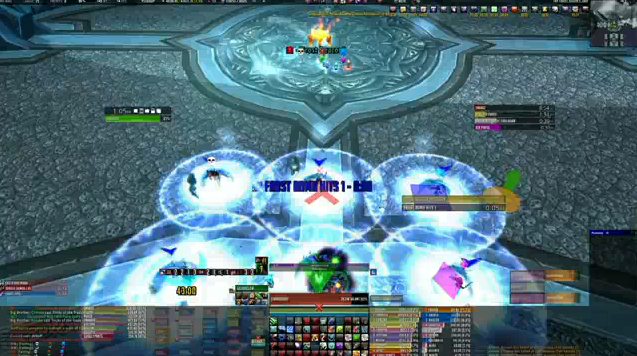 Your DPS rises and ultimately, the boss will die. This is how we learn. For most of us this takes form through repetition. Some people learn faster than others, that’s just a fact of life. However once all your raid have mastered the mechanics, your kill will come shortly after. Most subsequent kills happen with a great deal more ease because you have developed the skills and the reactions to deal with the encounter. Lets return to what does make a good player? Attention is part of it for sure. 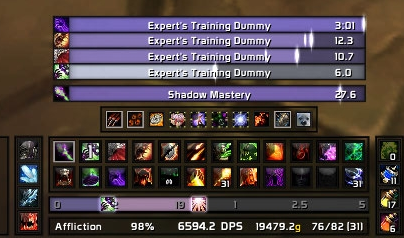 DPS who aren’t concentrating and are slow blowing cooldowns or slow moving into DPS increasing effects (think the shadow crash on General Vezax in Ulduar) will put out less damage than the ones who are 100% focussed on their job. The ability to play dynamically is also vital. There maybe times, as a shaman for example, where something needs interrupting or purging. An add could be slowed if you throw a frost shock at it. Most classes have a range of skills that they bring to a raid and the better players with utilise all those skills without someone needing to prompt them. They can see what is going on around them and they can react to it. A good raider isn’t the one who tops the meters while standing in fire and ignoring that everyone else is needing to interrupt to cover their personal unwillingness. A good raider is the one who does all the small things that make a kill smoother (or make it possible) whilst still maintaining a good level of DPS and not stressing the healers by taking unnecessary damage. Where am I going with this? Simple really, all these skills come from practice. They come from paying attention to what is happening around you and learning how to play your class to it’s fullest potential. If you start to depend on addons to draw circles around “danger areas” or to visually tell you where to stand, then what is left to think about? This kind of play doesn’t help to develop or create truly skilled players. It encourages people to not think so much when they play and allows lazy players to continue. All encounters are difficult when you’re first learning them but it’s through practice that we become better players and progress together as a team. There is a reason many cutting edge guilds will ask potential members whether or not they can play without addons. This is precisely the environment that can occur on PTR testing. 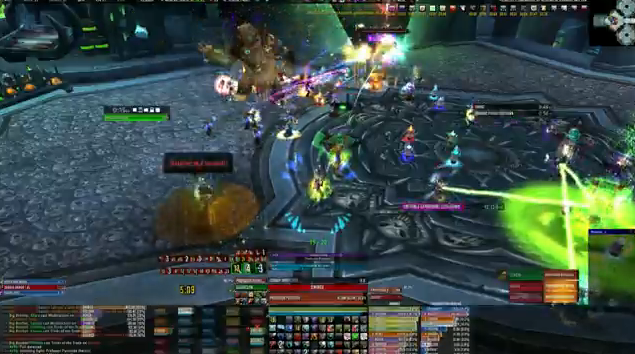 Raids can’t grind to a halt because someone’s addon didn’t get updated or stopped working for another reason. The reality for most of us is that we don’t play in those guilds either by choice or otherwise. Never the less, should we not be aiming to still be the very best that we can personally be? 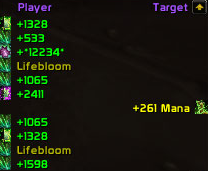 A dependency on addons to be able to perform doesn’t help you to become this. For those who are wishing to give this a try, you can download the addon here. It works alongside BigWigs, Deadly Boss Mods and DXE (you will need to keep your boss mod as it doesn’t include timers and the like). Last week I wrote an article about the factors that contribute towards someone being an exceptional player. One of the elements I covered there was the importance of a good, clean and informative user interface in ensuring maximum environment awareness in a raid situation. There were a couple of screenshots features in that article that showed my current Deadly Boss Mods configuration. 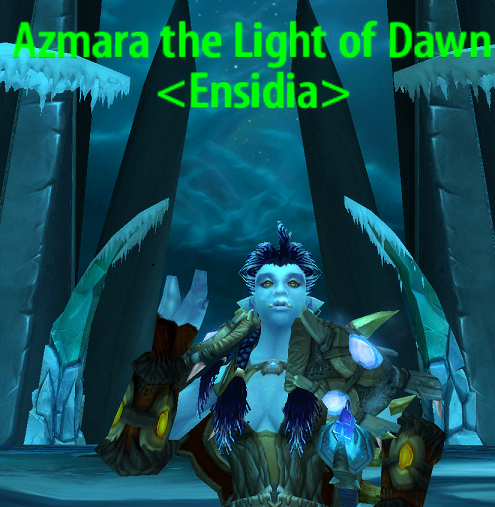 As I mentioned in response to a comment on the post, the custom layout was created by Damia of Memento Mori guild. For anyone unfamiliar with her, she’s been creating very good UI compilations for a number of years (though obviously geared to her own role of caster DPS). 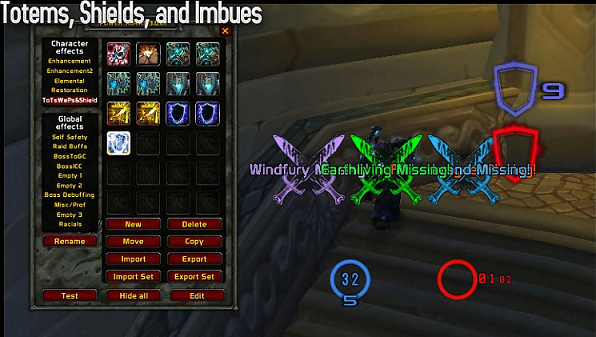 Should you be interested in either her DBM custom layout or her entire UI compilation, you can find it here. Due to the extensive modifcations she has made to DBM, you need to save certain files from the addon folder before attempting to update DBM. These then need to be replaced after the update to keep the visual layout the same. While it sounds a hassle, it’s really not that bad. 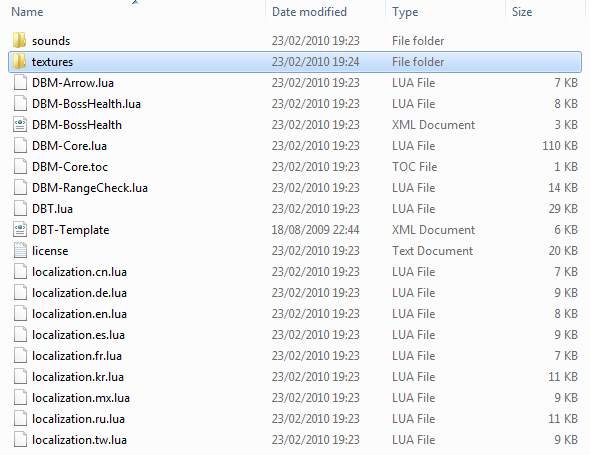 Locate the DMB-Core folder in your addons directory. From here, make copies of the textures folder and the dbt-template file. Save these somewhere else. When it comes to updating DBM, download the addon or update as usual (either manually or via the Curse Updater). 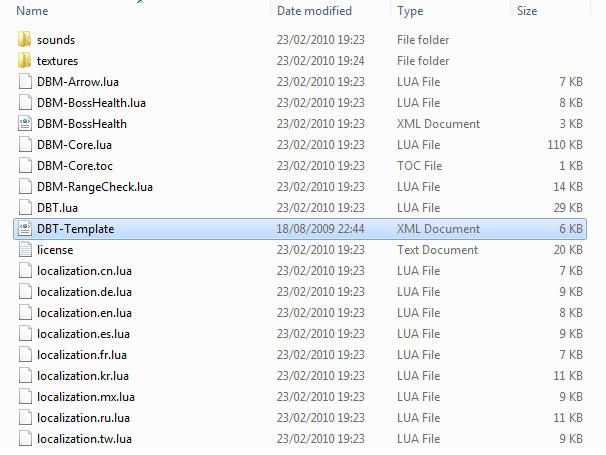 Once updated, copy your saved textures folder and dbt-template file back to the DBM-Core folder. You’ll be asked if you wish to merge or replace the files in question. Replace both. This will allow you to keep Damia’s amazing custom layout while still updating DBM to the latest version. Should you choose to download her whole UI, she has her own forum thread dedicated to answering any questions or addressing any problems that arise here. Don’t be put off by the Swedish in many of the posts, she’ll reply in English! 😉 Furthermore, any new UI compilations she releases will most likely be detailed there first. Patch 3.2.0 went live on the 4th of August 2009. This patch brought with it quite revolutionary (and long overdue) changes to totem management for all three Shaman specs. Prior to this patch, Shaman’s had to place each totem individually at the start of combat. 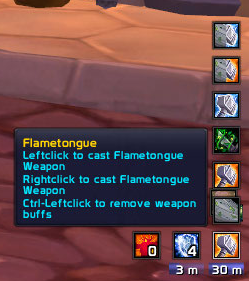 This cost four global cooldowns before they had even begun to DPS anything. 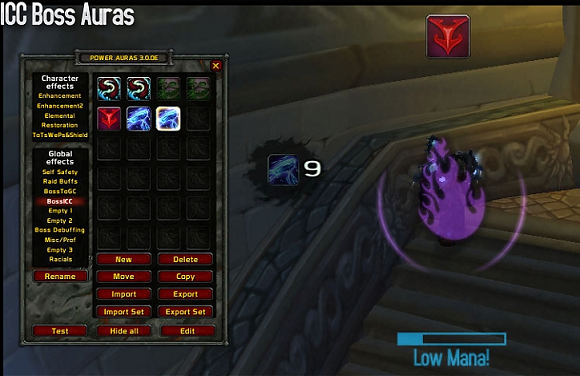 The Shaman could now create pre-defined sets of totems bound to one of the above skills. For example, an Elemental Shaman may choose to have two PvE sets (one with Totem of Wrath, one with Searing Totem) and then a PvP set (for the Faction Champions encounter in Trial of the (Grand) Crusader). These sets can be changed on the fly to meet the needs of specific encounters, such as switching a Healing Stream Totem for a Cleansing Totem. 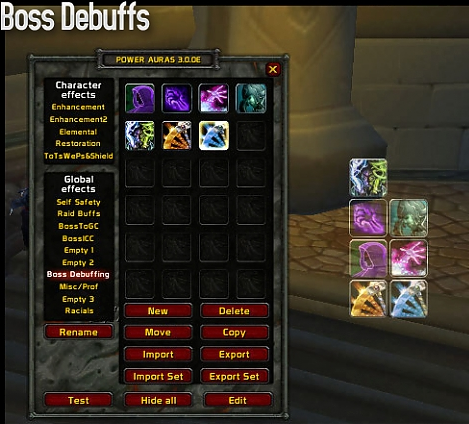 As with most elements of the default Blizzard UI, it wasn’t long before a number of players began developing their own totem bar addons with additional functionalities. For the raiding Shaman, managing your totems is vital. For people new to the class, learning to switch totems on the fly to meet different demands can be a steep learning curve. While they might seem a hassle to some, our totems add a huge amount of diversity to our class. 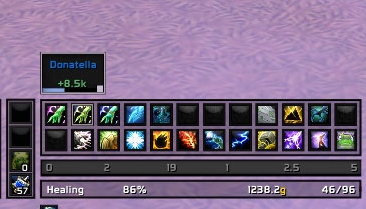 Taking the time to ensure your UI is configured in such a way to enable easy handling of totems is well worth it in the long run and will improve your performance as a Shaman. 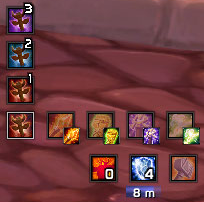 Much like the default totem bar, the addon allows easy configuration of totem sets. The actual bar features five buttons. The first is the skill that governs each individual totem set, that is to say, Call of the Elements, Call of the Ancestors or Call of the Spirits. Scrolling over this button will enlarge the menu to show all of the totem sets. The next four buttons constitute your actual totems, grouped by their elements and again, scrolling over them will expand the selection to show all the totems currently available per element. Scrolling over any totem will open a tooltip identifying the totem by name. In both instances, the tooltip will also offer a reminder of how to place the totem or how to add it to one of the predefined sets. Obviously, many features can be turned off or on to suit the individual. 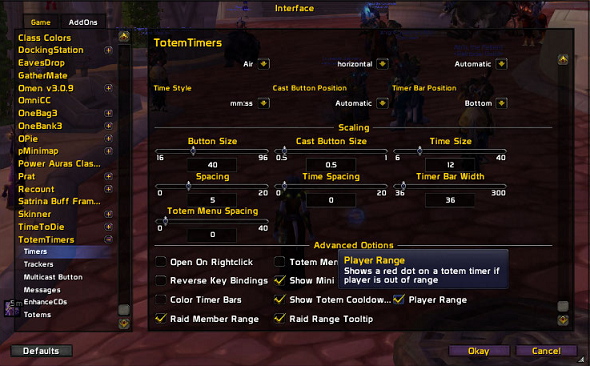 At it’s most basic level, Totem Timers allows you to configure your totem sets and view the durations of your totems. Upon mouse over of the multi cast button, the menu will open and show all three predefined totem sets, that is to say, Call of the Elements, Call of the Ancestors and Call of the Spirits. Naturally, all of these can be bound to individual keys via the default user interface key binding menu. 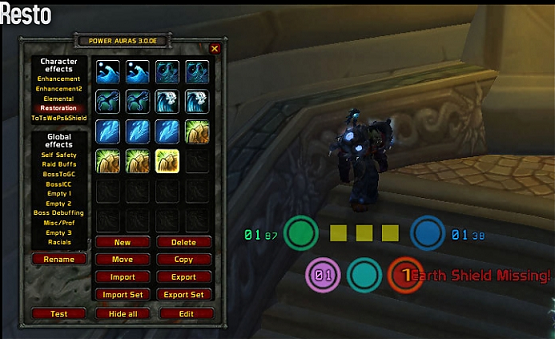 For the default UI, this is done by bringing up the game menu via the Escape key, clicking on Key Bindings and the scrolling down to the Shaman Totem Bar Functions. In the same way, hovering over a specific element with your mouse will open a menu displaying all the totems available in that element. Adding a totem to a set couldn’t be easier. You choose the totem set from the multi cast menu and then right click on the totem you wish to add from the individual totem listings. 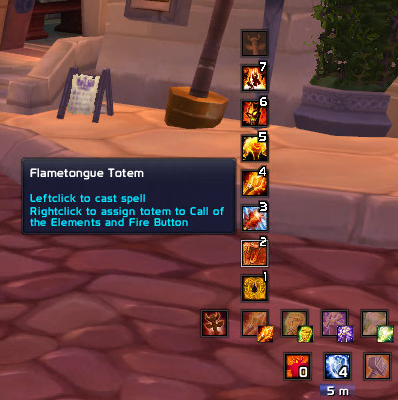 For new users, there is a default tooltip that will display both a totem’s name upon mouse over and also remind you how to add a totem to a specific set. 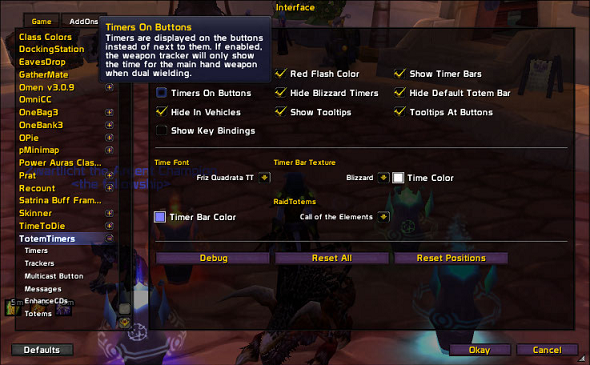 These tooltips can be disabled via the configuration panel for the addon. 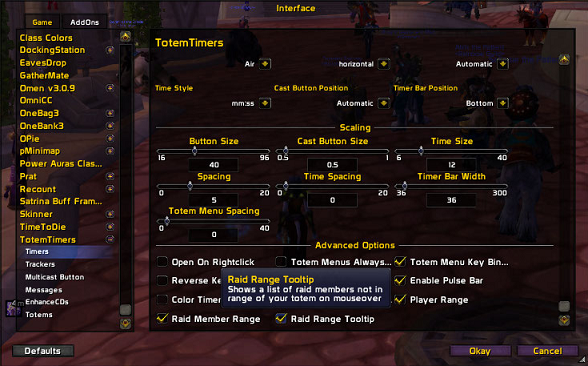 As mentioned above, if it’s basic “fluff free” utility you’re looking for in addon, most features of Totem Timers can be turned off. 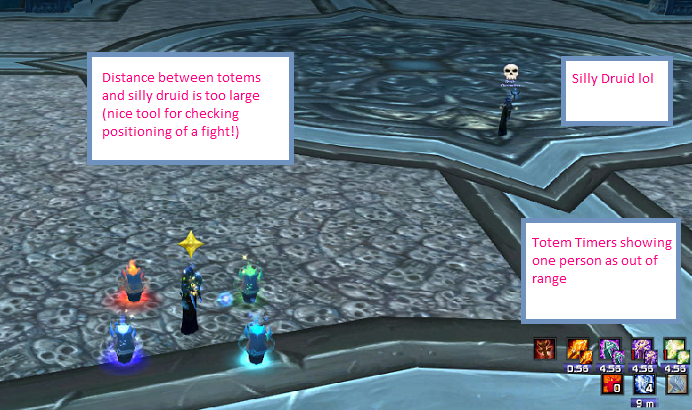 The durations of your totems can be displayed in two different manners. You can choose to show the duration remaining underneath the totem (and with a bar), or on the actual totem icon. 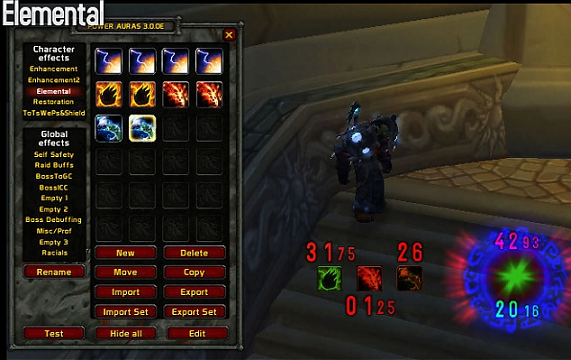 In addition to managing your totems, Totem Timers can also display your shields and weapon enchants. Your shields can be set to display their duration and charges remaining while your Flametongue Weapon will display the time remaining. 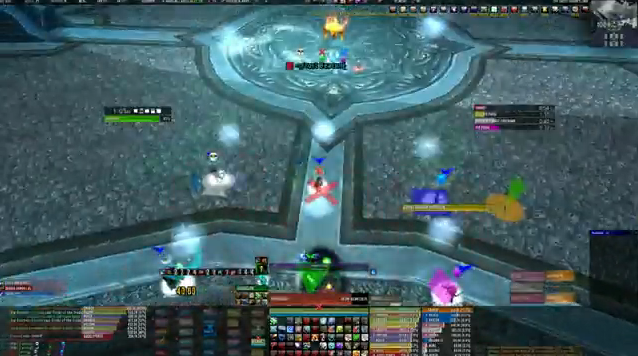 Totems have varying ranges and they have to be positioned to cover everyone in your raid. An excellent functionality of Totem Timers is the visual alert if yourself or a member of your raid is out of range of your totems. Not only can this aid with deciding positioning for a boss ahead of time, it also allows you to warn people on the spot that they are out of range of your totems (or adjust your totems if necessary). There are two distinct types of alerts you can choose to use for Totem Timers. Firstly, are personal alerts. 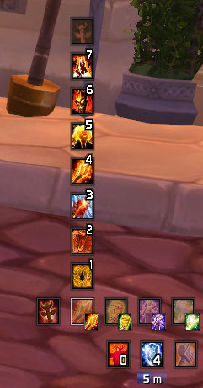 The addon will display a small red dot in the corner of each totem that you are currently out of range for. This is particularly useful when levelling or soloing. If you’re questing in an area with a lot of mobs bunched together, it’s not necessary to replace your totems every pull. There durations are long enough for this to be an unnecessary waste of mana. The self range checker will tell you exactly when you need to replace them without guessing or checking your individual buff effects. If it’s not an option you feel is necessary, then you can simply turn it off under the configuration window. 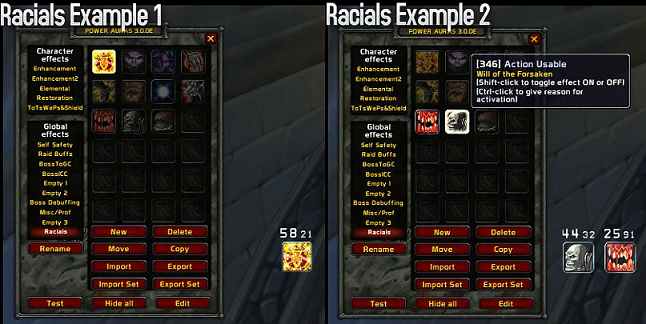 Secondly are the raid alerts and I personally feel these are essential for the raiding Shaman. 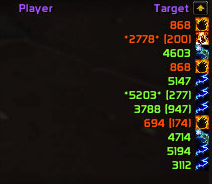 Most raid members should monitor their own buffs and will probably alert you to the fact that they’re out of range of your totems anyway. Assuming they’re not personally at fault for standing where they shouldn’t, be proactive and ensure everyone is in range of your totem effects. 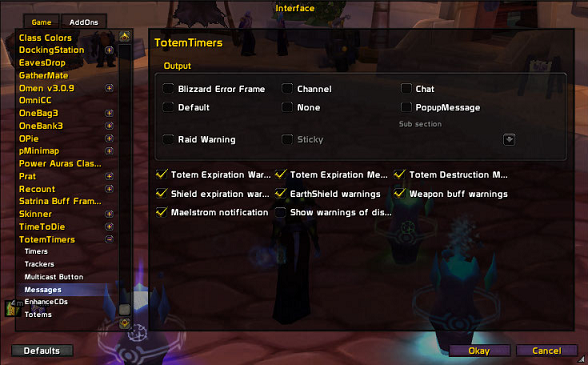 There are two levels of alerts within Totem Timers. 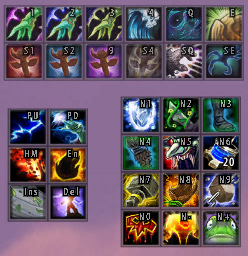 Firstly, the addon will display a number by each totem. This number will represent how many members of the raid are out of range of that totem’s effect. 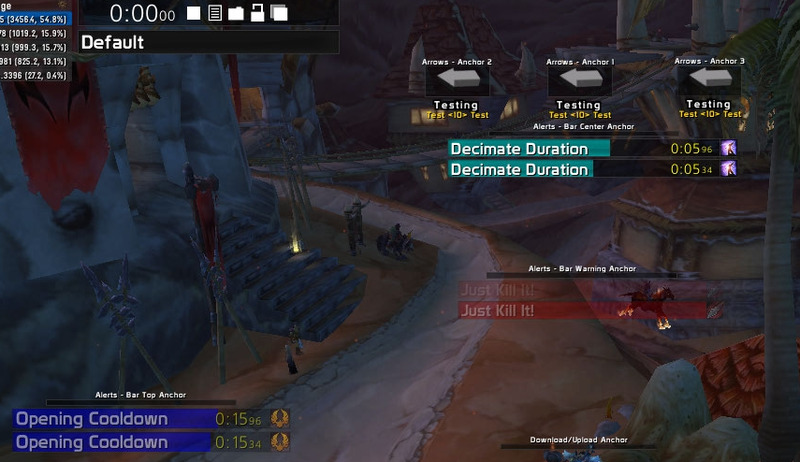 In addition to notifying you that people are out of range of your totem, the addon can be configured, upon mouse over, to list who those raid members are. Again, if this is more information than you want displaying on your user interface, you can simply turn this off via the corresponding check boxes in the configuration panel. Totem Timers has an in built feature that will cause the corresponding totem icons to visually flash red when they’re about to expire. Most of the time you should be aiming to think ahead and re-summon your totems at a time when it won’t cost you a global cooldown that could be used during a DPS period. Generally this is done during periods of movement in an encounter. If you know you have to move, the consider spending the GCD then to reset the duration of your totems (and their position if need be). If you haven’t done this, then the expiration warning feature will ensure you never accidentally let your totems expire without realising it. Once again, if it’s a feature that you simply don’t want, it can be turned off in the configuration window. Some totems, most notably our Tremor Totem and Cleansing Totem act on a pulse effect. That is to say, every time the totem “pulses” it will attempt to remove a fear component or a disease or poison, depending upon the totem in question. 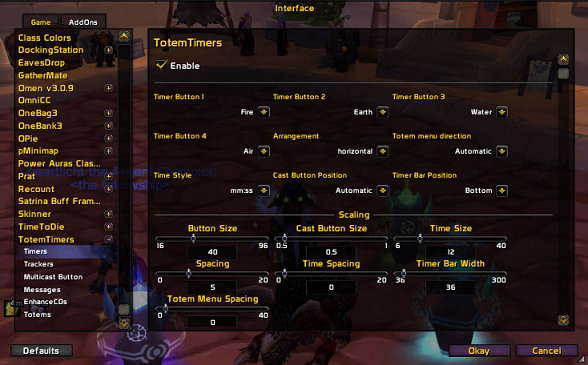 Totem timers gives you the option of visually seeing the pulses on the totems that utilise this mechanic. 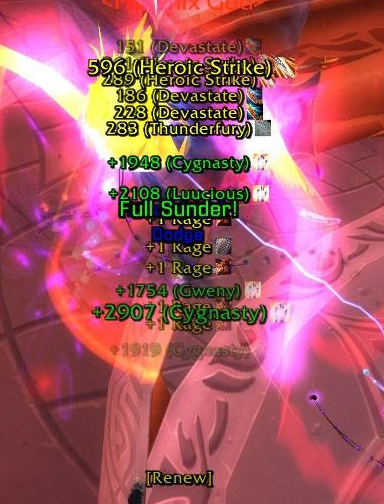 In addition, it can be set to show the cooldown remaining on our Reincarnate spell should we ankh mid fight. Finally, it can display the number of ankh reagents in your bags. Annoyingly, for those using Glyph of Renewed Life, this figure will only show as zero and the only way to remove it is to also remove your reincarnate tracker. For the people who like to keep a constant theme running throughout their UI, Totem Timers has good visual configuration options. Fonts, bar textures, button sizes and spacings can all be altered to suit the player. For players using Button Facade, Totem Timers integrates perfectly well with this and allows you to customise the appearance of the actual buttons to match with your Bartender visuals. This is created using Button Facade’s Apathy skin and with the gloss effect turned to 50%. In some of the screenshots used in this guide, I’ve turned the effects and skinning off for the sake of clarity. But I figured this was worth mentioning should anyone be interested! The beauty of this addon is how user friendly it is. Many addons with a lot of configuration options become insanely complex to set up and players can become intimidated by the sea of options set before them. 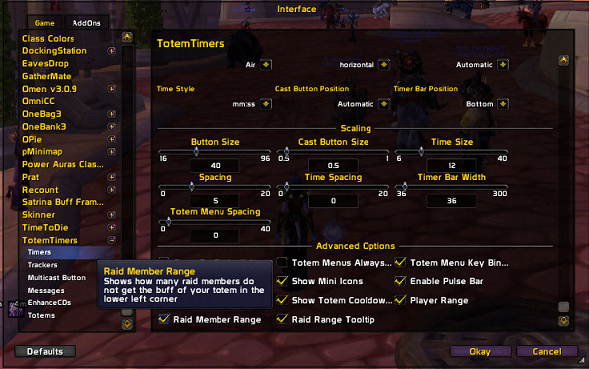 Totem Timers has a very simplistic configuration panel based on a series of check boxes. My one primary complaint about this addon is that it requires the use of Reflux to utilise profiles where as most of my favourite addons have a stand alone profile manager built into them. Luckily, the addon is easy enough to configure that this is a mild annoyance at best.